Because he was a gifted student/athlete at Delavan High School, Kiehm gained an appointment to the U.S. Naval Academy, Annapolis, MD. But a military career lost its excitement after his first year at Annapolis. Construction business was his ambition and if his love for flying could match up with a business career so much the better. So 'good bye' Annapolis, 'hello' Augsburg College, St. Paul where he graduated in 1983 with a business degree. Today Kiehm Construction Inc., Lakeville, MN employees 35 people at their office/warehouse/manufacturing facility at the Lakeville Air Park and Marty Kiehm flies a twin-engine Cessna 340 with pressurized cab. "This is the plane I use to visit clients, move clients to jobs, even travel prospective clients to view our work. I probably fly more than most pilots because my plane fits so well with our expanding business. I have a number of things going on across the country and I need to move from point A to point B. So aviation is truly a business necessity for me." And it's the high regard for composite foam panel structural material that is in fact now moving Kiehm Construction around the country. He explained, "We've found a niche and have figured out how to prospect the product. I think it's a far superior product to typical metal construction. Because we've learned how to work with the product, we often complete a project ahead of schedule and below the original bid price. "This is an excellent example of the product selling itself. We're now selling to a national account that started with a 12,000 square foot building at Shakopee, barely 20 miles from our office. Because this firm is dealing with a product needing lots of vertical space, we're building these structures with 24' composite foam panel sidewalls. "They've asked us to follow them around the country. Right now we're doing a building just outside of Washington D.C.; our next project with them is in Connecticut. They like the finished look of their buildings. As a contractor/builder we appreciate the convenience of working with such a product." Perhaps the product improves the overall efficiency of Kiehm Construction too. When asked 'How many projects do you feel you can comfortably coordinate at one time?' Marty Kiehm answered, "That's a function of delegation. I've got some very good people that are very capable. At any given time, my project managers can be following two to three projects each. So even in this recessionary mood, we will have three to six projects going." Retracing the construction economy, Kiehm indicated 2008 was their top revenue year so far. "2010 was a good year also but not quite measuring up to 2008. But this economy is constantly changing and we've had to change accordingly. We're moving into a couple of other construction areas. We're migrating into these other areas because money is in different places right now." Keeping an open mind about new business opportunities, he sees energy and agriculture as two industries with lots of growth, lots of new money. North Dakota's rapidly expanding oil drilling industry just might be one of those new opportunities for Kiehm Construction. "And we're seeing inquiries from the Ag market for a 'better building' than the traditional pole shed structure which has dominated agriculture for several years. Both farmers and rural builders see the advantages of steel and the convenience of clear-span, especially as farm equipment keeps getting bigger and bigger." Geothermal heated/cooled structures with in-floor heating systems and insulated composite foam walls for both modern farm shops and commercial farm equipment dealers are now frequently showing up on the 'construction bid' agenda of Kiehm Construction. "We've done millions of square feet of in-floor heat. Phenomenal product with the only question being how you are going to fuel it: waste oil, propane, natural gas, or the full route of geothermal. Geothermal is much more expensive, but the payback is there; it's just a matter of how long do you want to wait for it." On the topic of insulation products, Kiehm simply stated, "There's more to insulation than just 'R' values. Fiberglass has a place because it's an economical product. Air infiltration is a big factor. The closed cell stops air infiltration and that's what makes the composite insulated panel such a great product. It has all the advantages of precast: great insulator, impervious to water, air infiltration is practically zilch. However the panels do not have the 'impact durability' of precast." As the product gets more popular, there are more sources. He mentioned Metal Span, King Span, Vic West, MBCI, Gehlview Met, and EPS, plus there are now compatible products to make the finished building more architecturally attractive such as stone coatings, special stucco sidings, etc. And how does Kiehm Construction stay current on new products, new ideas with old products? "Trade shows, reading trade journals, and of course sales reps calling on us are the tricks to being abreast of what's new. Metal Con is one of the best trade shows on earth for guys like us who specialize in metal buildings," noted Kiehm. He also said they pay attention to the Concrete Expo each year because that show also introduces new concepts, net products. "And with the new LEAD programs coming forth, there's just a lot of information that you need to pay attention to." Like most contractors, Kiehm follows closely what's happening in the energy world. He thinks solar and other energy sources will start playing a larger role in the construction energy. "People tend to think of solar more suited for southern areas because the 'sun season' is considerably longer. But solar works better in our northern climates because in the south, solar tends to overheat. It's a great product but we have to figure out an easy and convenient way to keep the snow off in the winter season. He also raises the question of how do you make solar panels attractive from the street level. How does he handle 'new traffic' asking about energy issues, multi-functional doors, etc? "When you see demand, you start to inquire. You have to educate yourself so you can share good information with your people." Commenting on the Minnesota business climate, Kiehm echoes the thoughts of many Minnesota business entrepreneurs. "I was born here and have put my roots down here. But I don't see the business climate as being very favorable. We traditionally have a liberal political tendency in this state and in that atmosphere, taxes are always a front-burner item." Reflecting on Kiehm Construction history he said his firm has now done upwards of 30 hangars at various airports across the state, from Brainerd to Red Wing plus virtually every 'reliever airfield' in the Twin Cities area. Plus they're into high-end self-storage buildings of 15,000 to 20,000 square feet featuring drive-through accessibility and climate controlled environments. Earlier in his career he built some fire halls. He never ventured into pole barn construction, much preferring the structural integrity of steel. 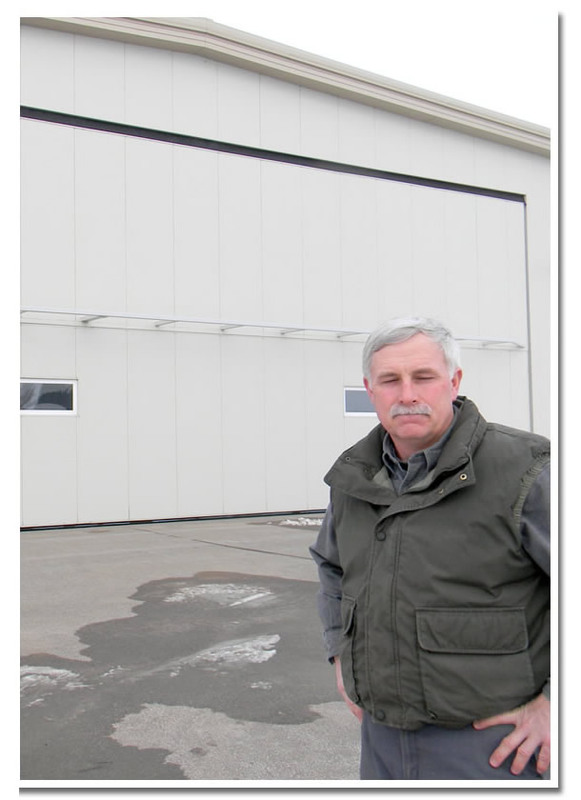 At the Lakeville Air Park, Kiehm Construction recently built two hangars, both featuring composite insulated panels and both equipped with Schweiss bifold doors. The 70' x 60' hangar is a 24/7 operation for a Med-I-Vac helicopter service. It features a 50' x 16' Schweiss bifold. 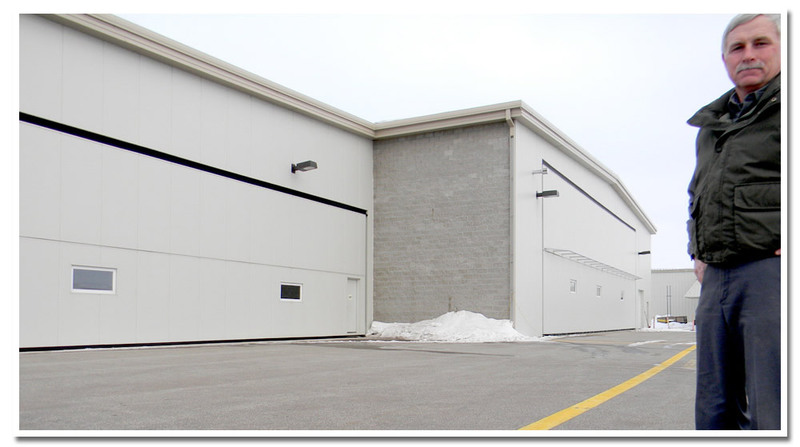 The bigger 100' x 80' hangar operates with an 80' x 20' Schweiss bifold. His affinity for Schweiss doors partly stems from the obvious of seeing Schweiss doors dominating hangars across Minnesota and the nation. 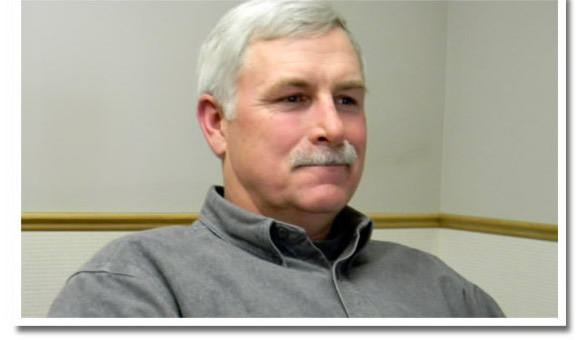 "But also Mike Schweiss has been very helpful, very positive on any of our inquiries. And he and his crew are always helpful with suggestions on how to overcome a particular door issue on any construction job. We've done retrofit jobs getting doors on buildings that structurally were not capable of carrying the door but Schweiss has always been very cooperative in working with us on how to adapt a door to a building. "They build quality. I've also noticed that Schweiss manufacturing is always looking for ways to improve their product. They've taken a very simple product, i.e., the bifold door and tweaked it, improved it functionally. Their lift-strap device is a remarkable engineering coup. And now Schweiss gives you a choice, the " Strap "bifold or the Red Power hydraulic door. I'm more a fan of the bifold, perhaps because we've done so many. "I've suggested to Mike that he consider this composite insulated panel material for his doors. It's the perfect solution for insulating a door without having to work around the framing structure of the door. Composite panel installed on the exterior gives you a full R25, or R32 or whatever thickness you put on. Schweiss is an innovative outfit so they'll likely give this a try," summed up Kiehm.